You are invited to the final Christmas concert "Festival Brikcius" - the 3rd chamber music concert series at the Stone Bell House / Cello and Piano & Five Jubilees, that will take place on Thursday 18th December 2014 at 7.30pm, at the Stone Bell House in Prague (Old Town Square 605/13, Prague 1, Czech Republic). French pianist Justine Verdier and Czech cellist František Brikcius will play compositions of five authors for cello and piano, who's important anniversaries we remind this year. 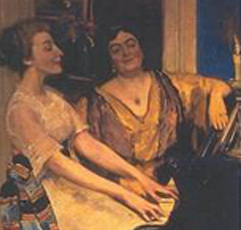 They are Pohádka for cello and piano by Leoš Janáček (1854 - 1928), Balada and Serenada for cello and piano op. 3 by Josef Suk (1874 - 1935), Sonatina concertante for cello and piano by Iša Krejčí (1904 - 1968), Klid op. 68 for cello and piano by Antonín Dvořák (1841 - 1904) and Variations sur un theme slovaque, H. 378 by Bohuslav Martinů (1890 - 1959). As a special encore they will perform Presto by Leoš Janáček (1854 - 1928). Tickets for the concerts at the Stone Bell House can be obtained either from Prague Ticket Office - Via Musica (http://www.PragueTicketOffice.com - Time Music, AMU, Malostranské náměstí 14, Praha 1 - Via Musica, Staroměstské náměstí 14, Praha 1 - Tel. : +420 224 826 440), Ticketon.cz or at the door from about 90 minutes before every concert. More information is available on http://Festival.Brikcius.com . 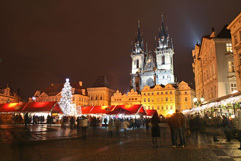 Thursday 18th December 2014 at 7.30pm, the Stone Bell House (Old Town Square 605/13, Prague 1, Czech Republic). What is the name of music for cello and piano by Leoš Janáček? Contest is over, lucky winner is J. M. from Lyon. More details about the T-shock, the T-shirt partner of the Festival Brikcius, on websites http://www.t-shock.eu . František Brikcius: Madame Verdier, you were born in Paris but you live in Madrid. How would you compare music life in both cities? F. B.: You started to play the piano when you were four years old. Later you studied piano at the Mozarteum University in Salzburg with Prof. Karl-Heinz Kämmerling and with Prof. Pavel Gililov. Why did you choose to continue your music studies in Austria? J. V.: Before entering Mozarteum at age 18, I studied at the Ecole Normale de Paris during 5 years. I met Prof. Kämmerling at a course in Holland and liked very much his way of teaching, quite different from the French mentality. Besides the fact that classical music in Austria is like a religion and it's the perfect place to study composers like Mozart, Brahms, Schumann or Beethoven, I also wanted to discover a new culture, learn German and get different influences as a musician. It was a very great adventure, and I think every artist should travel and get new experiences to enrich their interpretations. F. B.: You won many international music competitions, including the UFAM, the Claude Kahn competition, the Royaume de la Musique, the Sonatina and Sonata International Youth Piano Competition (USA), the Young Concert Flame Contest, the Milosz Magin International Competition, the Live Music Now Menuhin Foundation, the Foundation Hildegard Maschmann Scholarship in Vienna, the International Rotary Rotaract Ramon Llull in Palma de Mallorca and the "Bärenreiter" Prizewinner at the 10th International Mozart Competition in Salzburg. Did it affect your professional career? J. V.: A competition is always a good opportunity and motivation to improve your playing and your repertoire knowledge. Only for these reasons, I can say it affected my professional career as I got more maturity, besides the stress of playing in front of judges that helped me managing to control my nerves. Apart of that, of course, it has been a great way to meet important people in the classical music field and I eventually got some concert invitations thanks to competition's participation or prizes. J. V.: Well, it depends which kind of concert. If it's a solo recital, I like to plan the program quite a long time before so I can have time enough to practice, as it isn't the same pressure to play 90 minutes of solo piano without score or to accompany opera arias! I am usually quite relaxed at playing chamber music and always enjoy sharing musical moments on stage with other artists. F. B.: You have performed in many festivals and concerts in France, Austria, Poland, Germany, Italy, Ukraine, Spain, Serbia, Tahiti, Russia and the USA. What is your favourite kind of transport? J. V.: The journey itself is never what I enjoy the most although I love travelling and discovering new cities - that's why this profession is just great for me. I would say I prefer travelling by plane as you can go everywhere in a short time and in a 6 hours travel you can be in a completely different world. It's so exciting! F. B.: On Thursday 18th December 2014, we will play together music by Leoš Janáček, Josef Suk, Iša Krejčí, Antonín Dvořák and Bohuslav Martinů in Prague. What is your relationship to Czech composers? J. V.: When I was having my first piano lessons in Paris I remember my grandfather would always put an old audiotape of Dvorak symphonies in the car, and I already loved his music. I know mostly Dvorak, Smetana and Janacek's music and already played some pieces by them (Moldava, Smetana's Trio, Dvorak's Slavic dances, and of course the cello concerto's piano reduction of the orchestral part). I'll be very excited to discover new composers and get the opportunity to play them in their own country. F. B.: Have you ever been in Prague? J. V.: I spent a week holidays with my family in Karlovy Vary some years ago, so we just made a one day trip to Prague and walked around all the time, it looked wonderful so I definitely decided to come again and see everything in details! J. V.: Lately I have been working mostly with singers, with a few solo or chamber music appearances that I always enjoy, of course. I just realized my destiny is bringing me more and more to work as a collaborative pianist/singer coach; that's why I want to focus this next 2 years on improving this aspect of my piano skills. I'm planning now to participate in programs or auditioning to enter young artists' operas studios as a trainee repetiteur. As I have had a soloist formation, I feel the need to understand better the singer's world, their needs and what they will expect me to work out with them. However, beside that, I will always be excited about playing chamber music or solo repertoire, and I feel so lucky I can enjoy all the possibilities that this great instrument gives me. J. F.: Steinway! Bösendorfer is wonderful of course but doesn't fit for every composers. 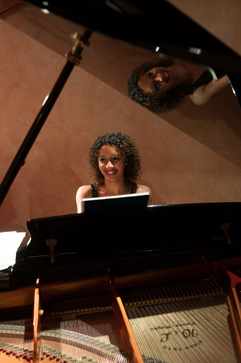 On a good Steinway you can play everything. J. F.: Last month I gave a concert in Menorca (a Spanish Balearic island), where I accompanied the tenor Carlos Llabres in his homeland and played some solo pieces too, by Chopin, Liszt and De Falla. It was a great evening and I saw the public from this place can appreciate solo piano repertoire as much as the opera arias that they are more used to listen. They were enthusiastic about everything and I enjoyed 2 aspects of my profession at once, the soloist and the collaborative. F. B. Thank you for your time and provided answers. 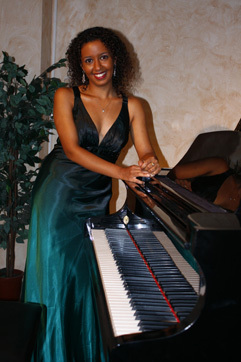 For more details about French pianist Justine Verdier visit websites http://www.Brikcius.com , http://www.Justine-Verdier.com and http://en.wikipedia.org/wiki/Justine_Verdier . 2. Festival Brikcius T-shirts, sweat shirts, cups, pillows and bears.